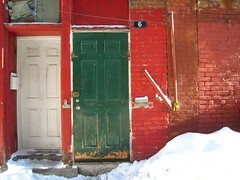 So maybe Montreal wasn't the best idea for a mid-January getaway from NYC. In my defense, it was probably 60 degrees in Fort Collins when I first made the plans with TL, TVD, and AS to go, and I have this inability to imagine shivering and being ridiculously cold when I'm sitting around in a tank top with the sun shining. How bad could it get, I figured? When there's gusting wind, a thick layer of snow on the ground, and temperatures hovering in the teens: Bad, I tell you, bad. Luckily, Saturday morning after our teeth-chattering, late-night arrival to Montreal in our rental car, there was breakfast. 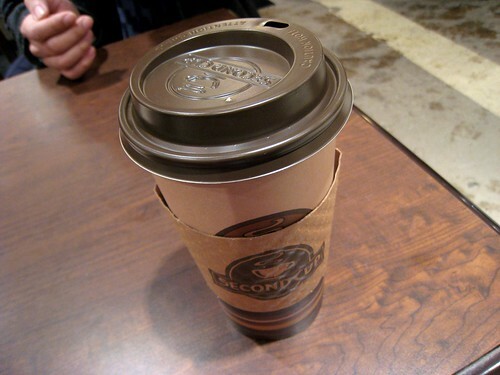 A good hot one, consumed at Eggspectation, a spacious "resto-cafe-bar" only several streets away from our hotel. As you might suppose from its name, the menu of Eggspectation is full of terrible egg puns, which of course I loved—no yolk! 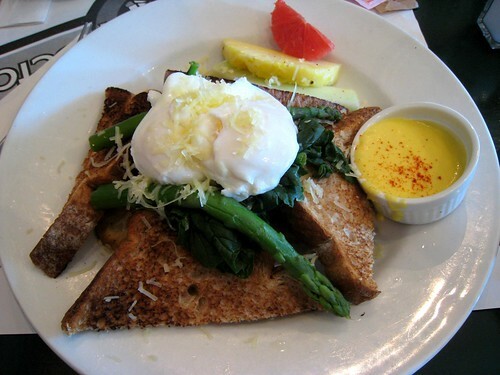 I opted for the "California Benedict," which threw smoked salmon, spinach, asparagus, and whole wheat bread into the classic poached egg and hollandaise equation; as usual, I didn't care for the sauce so I'm glad I asked for it on the side. The benedict came on a pile of fried potato rounds, which you can't see in this photo, but were good. 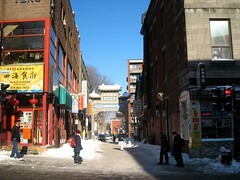 Altogether the four of us had a pretty solid breakfast, and thus fortified we went off to explore the Francophone city. 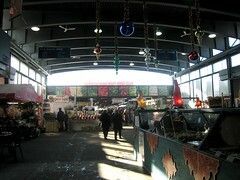 First stop was Marche Jean-Talon, a popular indoor food market I'd read about in Zach Brook's post on Serious Eats. 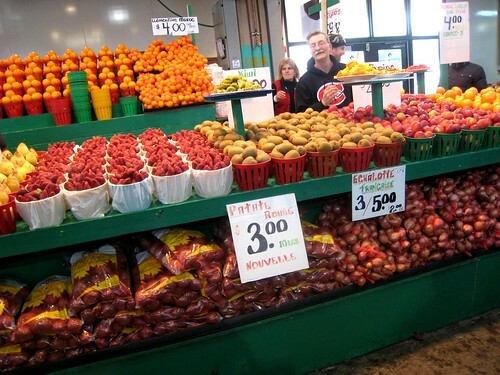 It's fun, with coffee and pastry shops surrounding stands of beautifully arranged produce, but as we didn't have any reason to buy anything we didn't stay long. We ended up in Chinatown next, where TVD went on an epic paper umbrella hunt on behalf of her Vietnamese traditional dance team, and I peered into all the windows of the restaurants and bakeries. 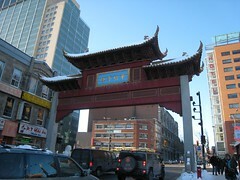 Montreal's Chinatown isn't large—maybe covering only a few streets—but seemed fairly diverse. 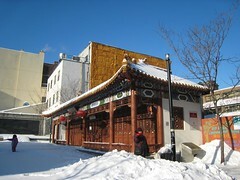 The area was filled with tourists and locals alike, turning the uncleared snow on the ground into wet slush. 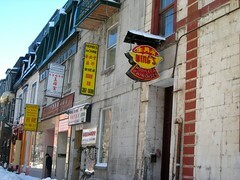 We hung out in Chinatown until TL's old friend CM and her significant other met up with us for lunch. 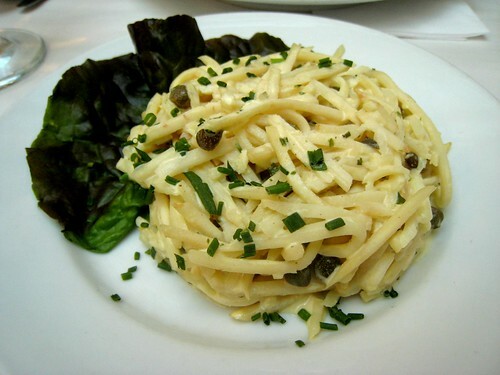 I was psyched when they suggested going to L'Express, since I had noted it as one of the restaurants I wanted to try. 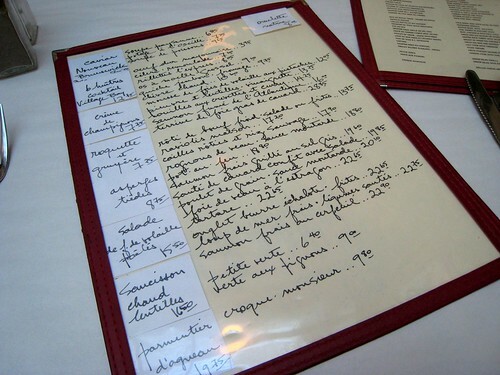 L'Express is a very French-feeling place, with classic dishes and preparations. 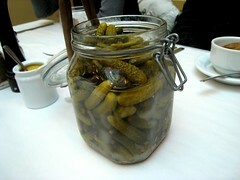 After we placed our orders, out came a giant mason jar of cornichons and baskets of amazing bread and good butter; I could have made a meal of these three items alone. 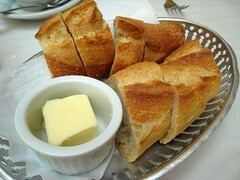 The crusty bread had great toasty flavor and a chewy crumb that I simply could not get enough of. I had read Orangette's loving ode to céleri rémoulade only a few weeks earlier, so when I spotted the creamy celery root salad on the menu I couldn't resist ordering it. I'd never tried this preparation before, and the dish was as she had described: a clean crunch in a rich dressing, a good accompaniment and starter dish. The recipe Molly posted for céleri rémoulade didn't include capers, but in L'Express's version they were there and added a nice pop and brightness. 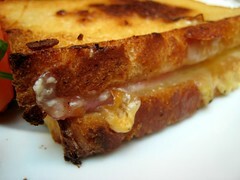 Three of us went with the croque monsieur, a hot griddled sandwich of ham and swiss cheese and béchamel. 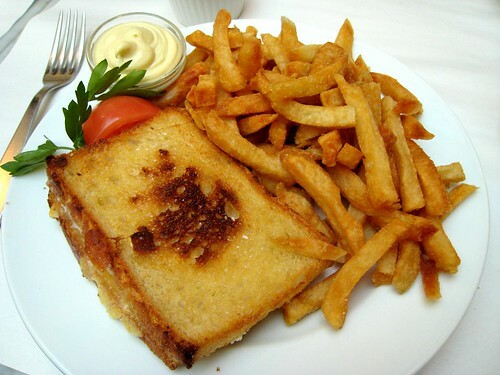 They came with a pile of excellent fries that were crisp and hearty with potato flavor, and I enjoyed the sandwich as well, which even made me a little nostalgic. The last time I'd had a croque monsieur was when I was in college studying abroad for a semester in London; my friends and I went to Paris for one weekend. 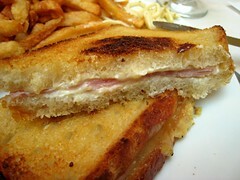 At the restaurants, the croque monsieur was typically one of the cheapest items on the menu, so that's what I would eat. I wished L'Express had offered a croque madame, too—the same sandwich but with a fried or poached egg on top—but at the same time, that's really just overkill. The plate was rich enough as it was. 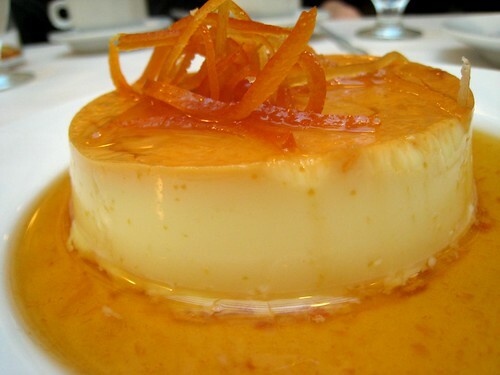 Something sweet was in order after that, so TL and I split a serving of orange flan, topped with candied peels and floating in a citrus-scented caramel. Light, creamy, and brightly flavored: it was a nice end to the meal. 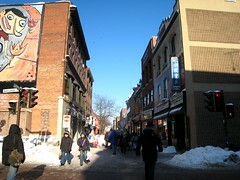 We parted ways with CM and spent the rest of the afternoon walking along Rue Mont-Royal and Boulevard St-Laurent. After a while, the weather became so cold none of us could feel our faces anymore. It was time to turn back, but by then we had wandered so far from our car that we had to duck into a branch of Second Cup—a Starbucks-like coffee chain—to warm up before continuing the rest of the way. Back at the hotel, all four of us nearly immediately passed out on the beds, not to wake until several hours later. We had gotten up early that morning, and it had caught up with us at last. 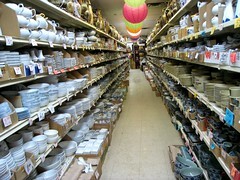 Finally, we roused ourselves and headed out in search of dinner. 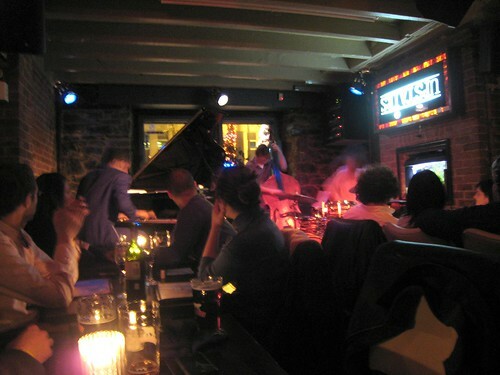 Since it was already quite late in the evening, our hotel concierge recommended we go to the nearby Upstairs Jazz Bar & Grill where we could have a meal, take in some music, and have drinks without wasting time moving from place to place. This turned out to be a fine suggestion, as the place was intimate, the food satisfying, and the performance relaxed and friendly. 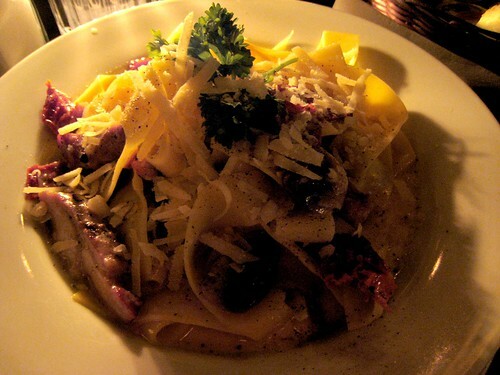 I had the pappardelle verona, flat pasta ribbons tossed with chicken, sun-dried tomatoes, mushrooms, and garlic in a white-wine cream sauce. It was a little strange to eat in near-darkness (you know how I feel about eating in the dark) but the meal was otherwise quite decent.